When Explorer 1 was launched in the 50’s, it “fell over” into a flat spin. After learning this physics lesson (“flat spin” is the lowest energy state for a prolate spinner), Syncom was designed as an oblate spinner and, therefore, stable. Ball, about the same time, introduced an oblate dual spin design for the first series of OSO satellites. Soon power and aperture growth were overly constrained by the oblate design “rule”. Along came Tony and the Gyrostat, a dual spin prolate design, to open up the design space for much higher power systems with despun platforms carrying large and multiple payloads. As the more astute reviewer will note, this is actually a “tri-spin” design with a doubly despun platform configuration. The solar array was unfolded and despun on the “south side” of the rotator. 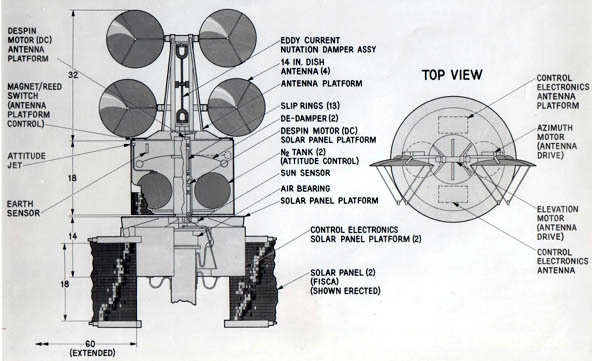 As the astute reviewer will also recall, this design was never implemented as 3-axis designs evolved in the 80’s to dominate the high power satellite design world. The model was rather sophisticated and very representative of the gyrostat’s potential design flexibility. As in the case with Syncom, the Gyrostat was patented and the model was critical in demonstrating a reduction to practice criteria. HS-308, TacSat, was the first Gyrostat and it paved the way for HS-318, HS-312, SDS and others that were developed and put into operation throughout the 70’s. TacSat’s “nutational anomaly” stirred a number of exhaustive pursuits into the mechanisms and sources of “rotor” energy dissipation. One such pursuit I personally got deeply involved with was the “fuel slosh” in the new “conispherical” tanks. That activity involved Jerry Salvatore and a scaled air bearing model set up in Culver City. Thinking that there was a “simple linear” energy dissipation formula, we set out to validate the formula’s prediction. However, when we put a closed circuit camera on the plastic tank with confetti in the liquid, reality struck. What we observed was total nonlinear flow and “churning”. From that point on we engaged in an extensive parametric test program to determine the energy dissipation rate and searched for resonances in fraction filled along with some limited inertia ratio changes. As a result of these early tests, we added an additional nutation damper to Intelsat IV before launch. While the tests were hard to conduct accurately in a 1-G field, it would be valuable to conduct an on orbit experiment validation. Al Owens was the Intelsat IV program manager and led the program successfully through 8 satellite launches with one lost to a LV failure. In charge of “systems analysis” I supported the 8 launches back at the ComSat control center in DC. That was a great experience with Marty Votaw and Gene Jilg in charge of the program and operation for Intelsat’s side. One “untold story” during the first launch: Gene Jilg and I were on “graveyard” ops shift duty and nothing was happening as we were waiting to get into the apogee motor firing orbit and position. Gene came over and asked what we might do to do something. I suggested why not perform a fuel slosh test to see how divergent the spacecraft really was in orbit and “real” 0-G. He was interested and wanted to know what we needed to do. I said we have to turn off the despun control electronics, DCE, disable the active nutational control (ANC) electronics, and let the platform spin up to centrifugally “pin” the eddy current dampers against the stops. Next we would need to pulse an axial jet to increase nutation to a measurable level via the fm accelerometer. I said we needed about one time constant to get an accurate measurement. That meant we would monitor the accelerometer and when we got to ~ ½ degree nutation, we’d send the DCE on command and enable the ANC. Gene thought a moment and said that sounds interesting and “fun”(my word)….and we did it! Those were the days when people were trusted over the process which now tries to control them (my words). Bottomline: Divergence was faster than the scaled slosh tests predicted so we added another nutation damper on subsequent builds. The result of the test made it clear that the ground tests were not good when scaling to inertia ratio since our test was with the apogee motor and in the transfer orbit mass/inertia state. This led to much more parametric ground testing to better map the fraction filled condition against the inertia ratio. In the end this became a very important finding from a test on orbit that was unplanned and probably not one that would have been approved prior to launch. 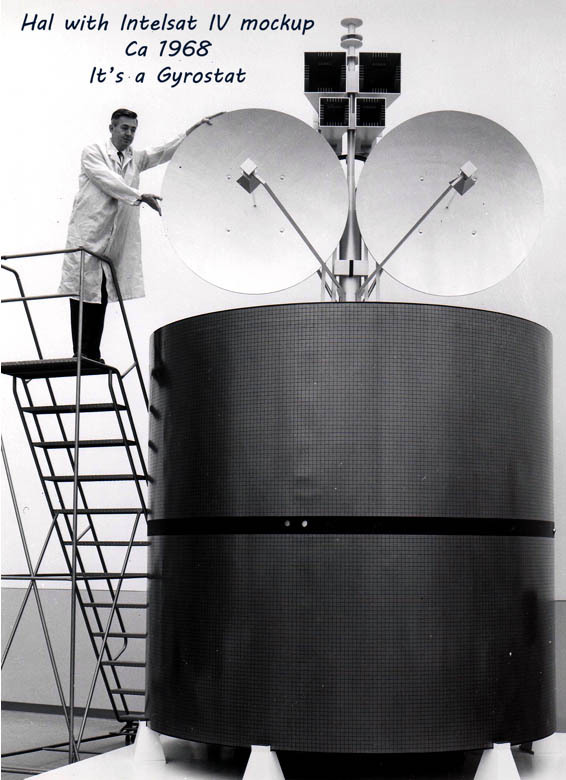 As a historical note of some more importance of using an Intelsat IV to conduct a fuel slosh test, Intelsat IV was used to carry the video from Beijing when President Nixon unexpectedly visited there in February 1972. Our colleague, Bernie Burns, went over to China to help set up the ground terminal needed for the relay back to CONUS. Thanks to all the colleagues and associates who helped invent the future in the 60’s and 70’s. This entry was posted in Technology by Jack Fisher. Bookmark the permalink. 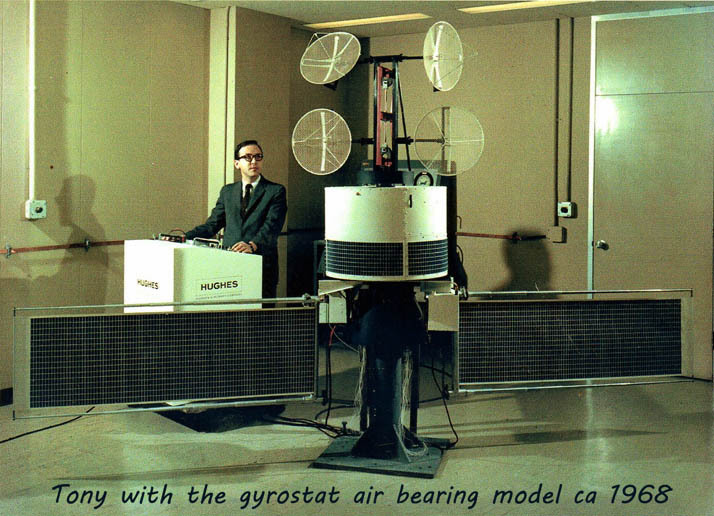 The gyrostat model pictured with Tony Iorillo was taken to a Convention in Anaheim that year and displayed. I learned later that others in the industry assumed that the configuration represented our future design concept for spinners.